45. Participate in citizen science feeder projects. Since the first Christmas Bird Count in 1900, Americans have been participating in organized “citizen science” project that collect data about bird populations. The Christmas Bird Count, sponsored by the National Audubon Society, has become a model for such projects, amassing fairly standardized data from across the continent for a specific time each year (early winter) and allowing researchers to discern trends in various species’ numbers. 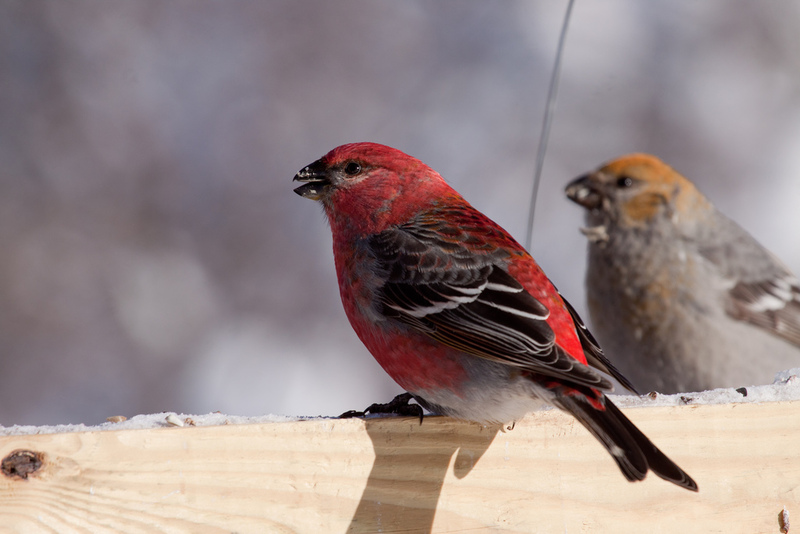 As valuable as Christmas Bird Count data are, the count period is too early in the season to provide much detailed information about winter finch movements, so the Cornell Lab and the National Audubon Society initiated the Great Backyard Bird Count, which provides a continentwide survey of bird numbers in February. Data from both projects can be mapped, providing an excellent picture of where populations for many species are concentrated. The Cornell Lab has several other citizen science projects, including Project FeederWatch, which provides a picture of where any species are year-round, and Project PigeonWatch and Urban Bird Studies, which provide fascinating information about birds living in urban settings. Cornell also amasses data from nonprofessionals for its House Finch disease study and other important and interesting projects, such as its chickadee winter survival study. Cornell and Audubon also collaborated to initiate a new program called eBird, which allows birders and feeder watchers throughout North America to enter every bird they see afield and in their own backyard into a database. Advanced birders in each state help verify details to confirm rarer species and unusual numbers. As more people become aware of eBird and start contributing their sightings, this project has the potential to become one of the most valuable sources of information about year-round bird numbers ever developed.